By the numbers, during November I wrote 45,278 words, at an average of 1,509 words per day—up quite a bit from October. 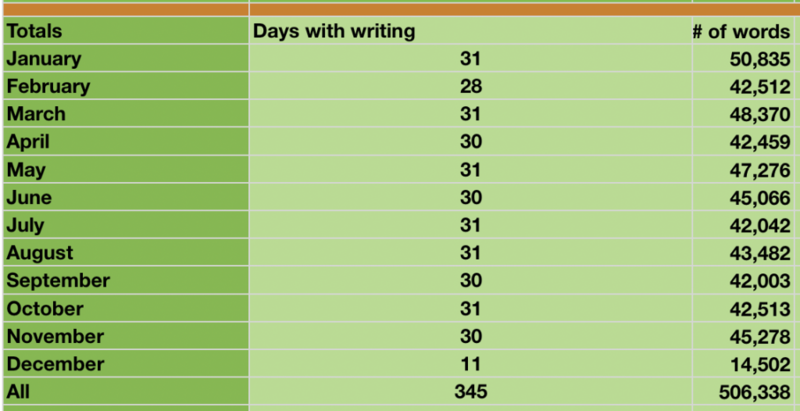 I wrote every day, which put my writing streak at 411 days in a row as of Nov. 30. That also put my 2018 word count at 491,836. Yup. That's right. Home stretch to 500,000 words for the year! But not. I'm actually just going to spoiler that for you. I crossed the 500K threshold on Dec. 6, and as of Dec. 10 am at 506,155. Note that I said threshold, not finish line. Finish line implies stopping. That you reached a final destination. There is no final destination in writing, except when you decide to stop. And I'm not stopping. There are so many stories to tell. So many wonders to share, joy to kindle, love to reflect. As I plan and look ahead for 2019 and beyond… wow, there's so much I'm excited to share with you. To riff off American Revolution hero Captain John Paul Jones, I have not yet begun to write.